We’re proud to bring on Densie Webb, PhD, RD, to our blog for the next six months. Densie has written seven books on nutrition and is a frequent contributor to The New York Times, Women’s Day and Prevention, among others. New study finds coconut oil may help protect the liver against side effects from antibiotics. January’s not over yet. There’s still time to set your New Year’s Be-Healthy resolutions. With that in mind, I wanted to share the findings of a new study, published in the Journal of Basic and Clinical Physiology and Pharmacology, that provides more proof that virgin coconut oil can contribute to your good health in 2014. We’ve all taken antibiotics to prevent or treat infections. One popular antibiotic that goes by the brand names Bactrim, Septrin or Septra is widely used to treat respiratory, gastrointestinal, urinary tract infections and for some patients with HIV infections and low blood cell counts. It’s popular because it’s really effective, acting as a sledge hammer against a wide variety of bacteria that can make you sick. But it’s not without side effects—it can be especially toxic to the liver. In this new study, researchers found that supplementing the antibiotic with virgin coconut oil provided significant protection against some of its toxic effects, as measured by blood markers of liver damage. 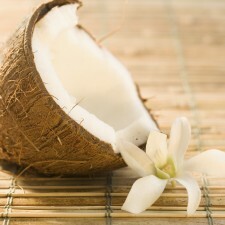 They believe the active components in virgin coconut oil are responsible for the benefits. Because virgin coconut oil isn’t heated or subjected to processing, it retains these important biologically active components. The study was done with rats, so we can’t be sure if virgin coconut oil would be as effective in people, but the researchers said that their findings “strongly suggest” such benefits and were adamant that the results deserve a study in people in the near future.